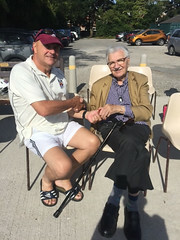 8 months ago ago by Old Parkonians.Cliff Crozier still going strong at 102 (next birthday on September 6th) was the match ball sponsor for the 2 XI game against Saughall. He is pictured with Captain Dave Buey. 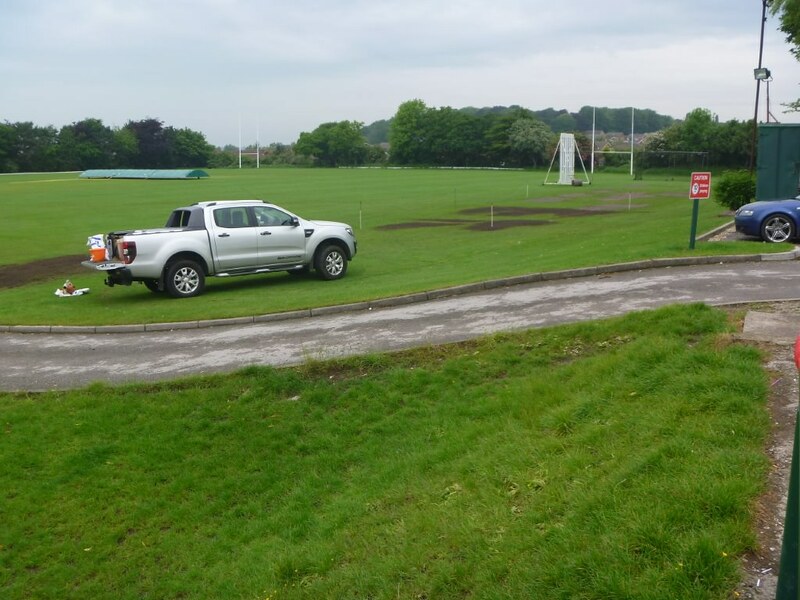 The resurfacing of the access road from Holm Lane to the Clubhouse was completed on Friday 25th May as planned and to budget. Our thanks go to the many people who enabled this to happen, including those who made significant donations to the Club. 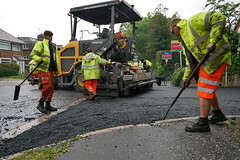 Also to contractors Multipave for a job well done and for their help throughout this project. 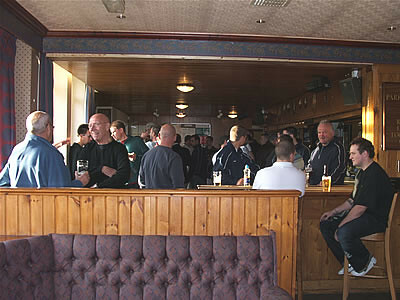 For some time Bar Staff have held a Visitor Card for discount to be given on Saturday afternoon to visitors from other clubs. Over time, members forgetting their cards have been able to ask the Bar staff to let them have their discount using the Visitor Card. We'll be withdrawing visitor discount from 1st March and so from that date, discount will only be available to members though their own cards. We'll be going back to the "No Card, No Discount" service that we used to operate on. Check you have your card and that it works ASAP! Members are also reminded that their cards are not transferrable and so if you forget yours, don't ask to borrow someone else's - your discount will go to help keeping the Club open! Email membership@oldparkonians.org.uk if you've lost your card or find it isn't working. In the week of the Calcutta Cup the Club is saddened to report the passing of Jim, elder brother of Harry and Robert, who all played at Holm Lane. Jim left Wirral in the late 60s for Toronto, came back to Hull in the UK and then moved again to Atlanta USA where he died. My abiding memory is Jim in the back row and Harry at stand off conversing in the impenetrable 'Dunfermline Twang' on the pitch, both teams were left in the dark! Our condolences to his wife Pat, Michael, Claire and all the family. It is exceptionally sad to have to report on the sudden passing on, totally unexpectedly, of our good friend Richie 'Taff' Gibbon on Tuesday 26th September; 'Taff' was only in his mid 50's and was very fit cycling almost every day. 'Taff' came to the Club several years ago and almost immediately took over the captaincy of our then pretty much defunct 3rd Team. By his own admission he was not the greatest of players but he was a phenomenal organiser and leader of men . His match reports were legendary and made mine appear exceptionally brief. With living on the other side of water in Thornton he eventually moved to Ormskirk RUFC where he took on the 4th team captaincy and his match reports became even longer!! Coming from Pontywaun, South Wales, he was obviously a great fan of the Welsh national side and made sure you knew it too !! His knowledge of popular/rock music was incredible and he was a very talented musician as well , appearing in several local bands. He will be sadly missed by everyone. A true gent and giant of a man in so many different ways. Subscriptions have not changed since 2013 and with rising overheads, the recent AGM of the Association approved an increase to non-playing subscriptions of 10%, rounded where appropriate. Playing memberships remain unchanged, as part of our commitment to participation in sport at all ages. In addition to existing Bronze, Silver and Gold Development subscriptions at £10, £20 and £30 a month, we have introduced Bronze+ and Silver+ Development subscriptions at £15 and £25 a month. We value the additional contributions that Development members make to the Club, thank all for their continued support and ask all members to consider moving to a Development subscription if possible. New monthly subscription rates are shown below and will be applicable from 1st October 2017. There is no action you need to take about this - the change will happen automatically. You will see the changed subscription amount in your email notifications from WebCollect / GoCardless. If you have any questions on subscriptions, or would like any help changing to or upgrading a Development Membership, please let me know. 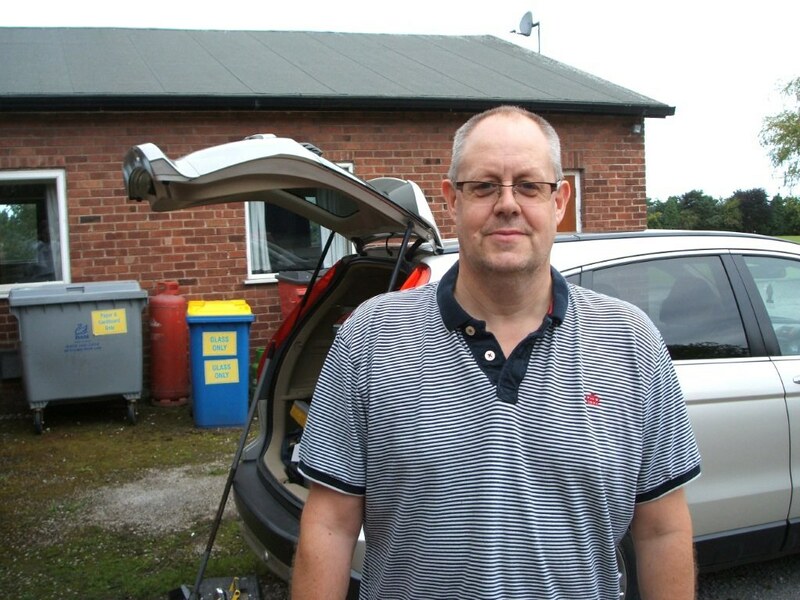 On Sunday 16th July, Old Parkonians hosted a fundraiser at the Club, set up to raise money for Robby Potter, a former rugby and cricket club member who was critically injured in the Manchester Arena terrorist attack at the Ariana Grande concert back in May. 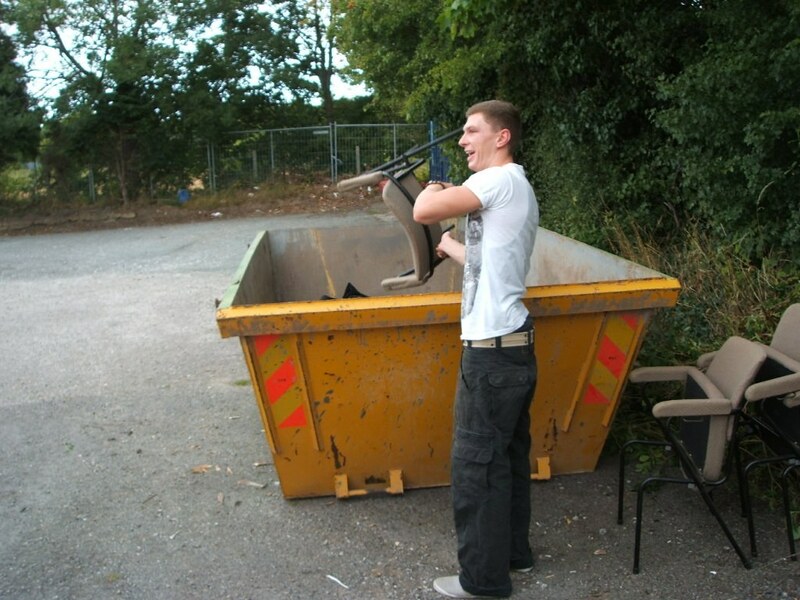 For the past two months, Robby has been looked after in Wythenshawe Hospital, slowly recovering from severe injuries caused by the shrapnel in the explosion. Old Parkonians decided they wanted to do something, no matter how small in the grand scheme of things, to help raise as much money as possible to help Robby and his family during this terrible time. 1 year ago ago by Old Parkonians.The decision was taken for the main focus of the day to be centred around a 6's Cricket Tournament at their ground, Holm Lane in Oxton, sponsored by the ECB Cricket Fest, with other fundraising activities happening throughout the day. Being lucky with the weather after a rainy start to the day, the Old Parks team worked hard setting up bouncy castles, BBQs, raffle prizes and items to auction. On the run up to the event, the fundraising team were bowled over by the generosity from local independent businesses who donated such great raffle prizes for the cause. A special thank you goes to the The Courtyard, Stag Barbers and Home Brew all in Oxton Village as well as Salt & Chilli Thai Restaurant in Prenton, Wirral Sports and Kanokphons Thai Massage Studio in Market Street Birkenhead. 1 year ago ago by Old Parkonians.At 12 noon, 36 enthusiastic club members turned up for an afternoon of competitive inter-club cricket. All those taking part payed £5 to play and the teams were split down by two teams comprising of mixture of 1st and 2nd team League players, "The Travellers Rest" from Warrington, Oxton Parkonians rugby players, social members, and a ladies' team. In the usual spirit of Old Parks, the afternoon contained lots of fun and laughter, with the fiercest competition being centred around husbands and wives trying to bowl each other out! The day was a huge success and raised £2200 in the process. This total will be added to another upcoming fundraiser for Robby which will be held on Sunday 23rd July at the Irby Club for an afternoon of live music. 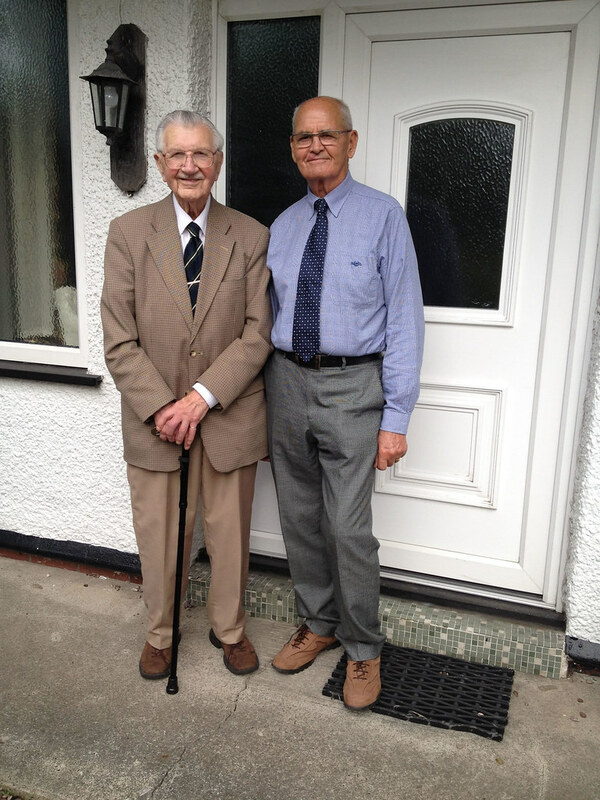 2 years ago ago by Old Parkonians.Cliff Crozier, our oldest member (Bidston Avenue and Park High school), celebrated his 101st birthday on September 6th 2016. He cannot open the batting these days nor scrummage very well but he was on fine form at a lunch this week hosted by Chairman Dave Westwater and wife Joyce. For those in doubt Cliff is on the left! A sobering thought - he was 10 months old before the battle of the Somme began! Happy Birthday Cliff from all at Holm Lane. 3 years ago ago by Old Parkonians. At last the rain stopped and we were able to make use of our excellent new feature, the complete frontage decking of the Clubhouse. An added bonus was the ability to switch between our match and England/Wales as it was shown on the Club's Sky Sports big screens! 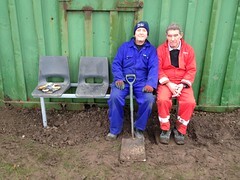 What a day, a good win by our 1st Team, 29-18 against Newton-Le-Willows, England beating Wales, a great atmosphere in the Clubhouse and an extended viewing rail welded into place by Mervyn Pryce ably assisted by welders mate and concreter Steve Kearney. Congratulations to players, supporters, bar staff and the ground team for making it a proud day to be at the Club. 3 years ago ago by Old Parkonians.The Club has suffered a great loss with the passing of our blue Ford Dexta Tractor. 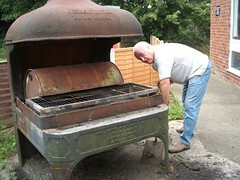 After 39 years of valiant service he has gone to a better place. Yes, it was in 1976 that he made his debut at the Club, ever a reliable starter and always safely garaged for half his time in the Old Pavilion. 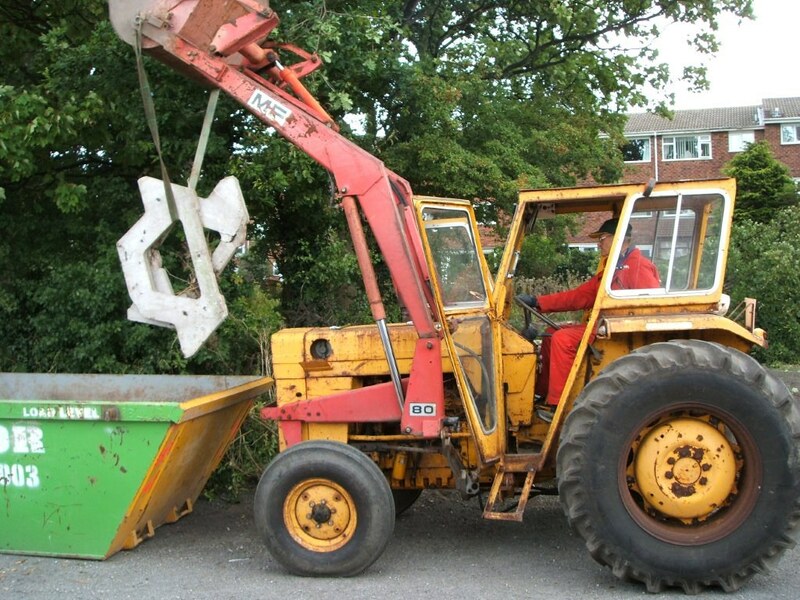 There will be a ‘Tractor Jug’ doing the rounds in his memory on Boxing Day. We say farewell to 856 FPR and think kindly of many happy memories. Photo is of Virginia Tocchini in her OPRUFC shirt. Her Father Marco is Chairman of the ‘Friends of OPRUFC’ group in Francavilla al Mare, Abruzzo, Italy, 25 years ago he had one season with Gloucester. He will be over for the World Cup in September, visiting the Club, drinking lots of beer whilst wearing his Gloucester and OPRUFC shirts, not at the same time! 4 years ago ago by Old Parkonians.Unseen by most people who use the Club, on both a playing and non-playing basis, gound maintenance goes on 12 months of the year. 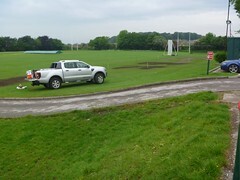 Although work carried out on rugby pitches during the summer is visible, a rolling programme of work is needed to keep the grounds in playable condition. This covers the application of fertillizer and weed killer at specific times, grass cutting when required and particularly ensuring that the drainage is up to scratch. Anyone interested in getting involved in the ground maintenance programme should contact Dave Westwater. "As Club President, I would like to welcome you all here today. This occasion is a chance to say a big thank you to everyone for all that you have contributed to the Club over the years and hopefully in the future too! Thank you, each and every one of you. I would like to especially welcome Cathy Bunting, the designer of our new lounge, Anne-Marie Lonsdale from FMS Interior Services, the contractors who fitted out the lounge and Abdul Salam from the Ruhi Balti House, sponsors of the Junior Rugby Section. |I would also like to mention Tom Bartram, RFU North Facilities Manager, who approved the Social Spaces Initiative bid; he said that it was one of the strongest and best planned bids presented to him. We are indebted to the Peter Johnson Foundation Trust for their generosity, as well as several senior Club members. 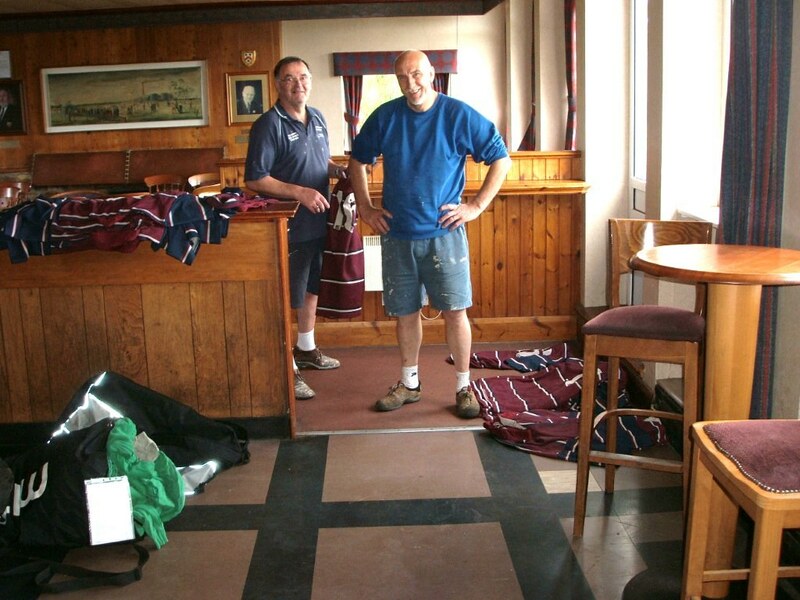 As you can see, as a result of this we have a lovely, completely refurbished lounge in advance of this Autumn’s Rugby World Cup. I thank Club members too who have been involved in this project; it is very much appreciated. Geoff Davies, ex-President, is unable to be with us today as at short notice he has been able to have his back operation at Walton Hospital. We wish him well in his recovery. We are, of course, delighted to see his wife, Margaret and daughter, Anne-Marie. Eric Potter cannot be with us today, due to his convalescing following recent time in hospital. Today, sadly, is the 7th anniversary on this the 7th day of the month of the passing of Brian “Gus” Cusick. He is sorely missed by his family and all at the Club. I am delighted to welcome his daughter, Mel, here today. She is a very generous Development Member and the Cusick Family are today’s Match Sponsors. After the game we shall raise a glass or two of Aussie White and toast Gus. I do hope you will stay to watch the 1st Team play Liverpool University. They will be wearing a brand new kit kindly sponsored by the Peter Johnson Foundation. Many thanks to Chris Hall in anticipation of his superb catering as usual. I hope you enjoy the meal and the game. Finally, once again, many thanks to you all for your continued support, because without you we would not have our wonderful modern changing rooms, and our new Members’ Lounge. 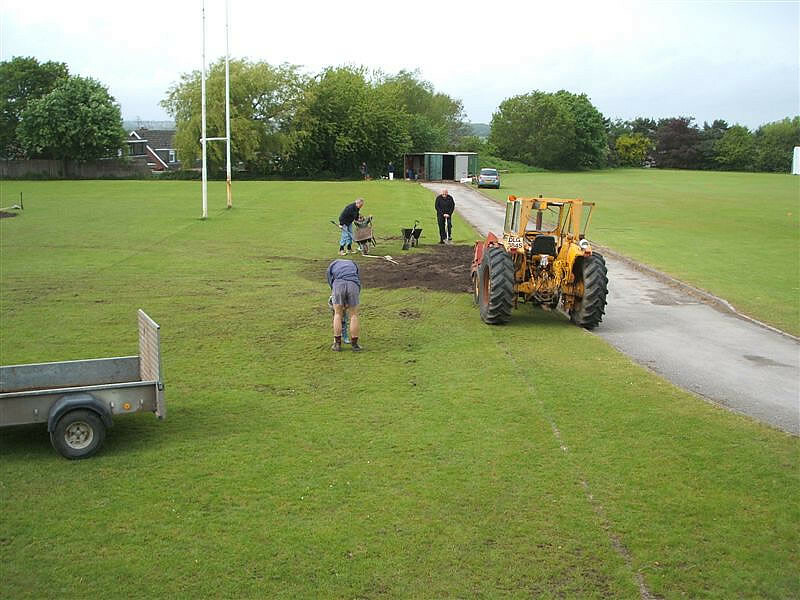 Under our development programme to improve the playing surfaces we have laid, seeded and fertilized 38 tons of root zone material on the 1st and 2nd pitches. 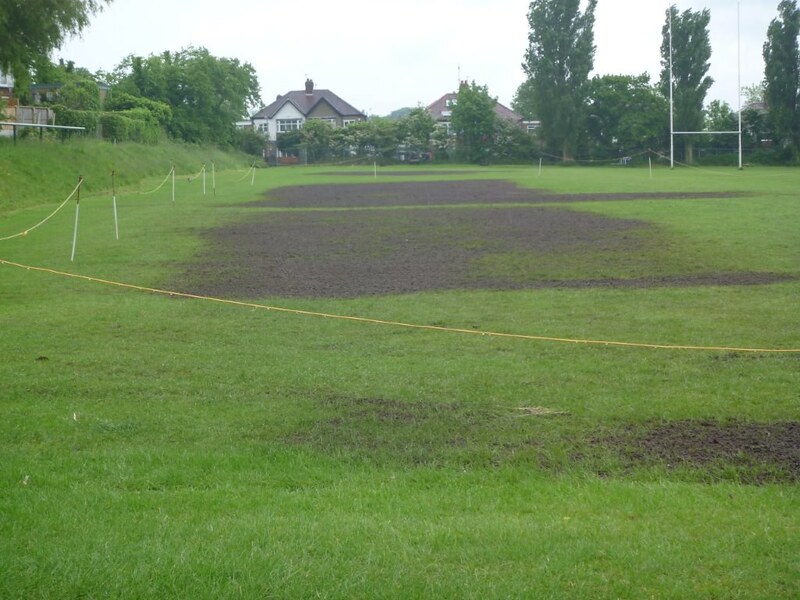 We would like all members to keep well away from these areas so that they can become established ready for the upcoming rugby season. 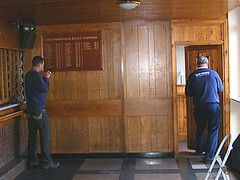 To prevent damage in the early part of the season designated pre-match line out practice positions will be marked out. 4 years ago ago by Old Parkonians. 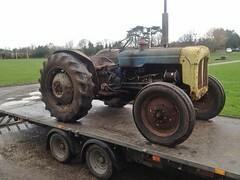 Everyone at the Club would like to offer their condolences to Association Chairman Dave Westwater over the recent damage to his new tractor. Since Dave's departure for a 3 week holiday in Italy, tractor racing has been an enormously popular Saturday afternoon event at Holm Lane. This weekend was no exception, with everything going well until the last race of the day, a grudge faceoff between Eric "Slow & Steady" Potter and Geoff "Boy Racer" Davies. With Eric taking a narrow lead before the Cricket Square Turn, Geoff gunned the engine of the John Deere Super Sport to go round the outside. With the crowd telling him it was too much, he rolled at the final bend (well, tractors are meant to aren't they?) leaving Eric to coast home. We can confirm that most of the welding work will be completed today and that by the time he returns home, Dave won't see a scratch on his beloved new machine. The Association's web site was set up in 2007 and was built using the technology current at the time. The site has grown to receive around 2,500 to 3,000 visits and around 7,500 page views a month and has expanded over the years as people have contributed content of different types. In 2011, an add-on to the site was developed to make it easier for people using mobile phones and other small screen devices to look at results and sport reports. However, with the development of Internet and web site technologies the old site had become outdated in appearance and functionality and so a new site has been developed. This enables easier management and development of the content and the way in which it is presented. The new site is responsive, which means that it changes the way it displays automatically, depending on the size of the screen being used to view it. As part of the upgrade process, photographs have been moved to Flickr and can be accessed at the Association's Flickr page - there are around 1,500 photos currently available. The site will continue to be developed - if anyone has any suggestions or thoughts on new content or features, contact Alan Morris on alan@oaknet.co.uk. First of all I would like to wish you all a very Happy Christmas and a prosperous New Year. It has again been an eventful year for the club and indeed for myself. The club became a limited company, Old Parkonians Association Limited, in November of this year. We are indebted to Alan Morris(Jnr) for taking the lead role in this success. 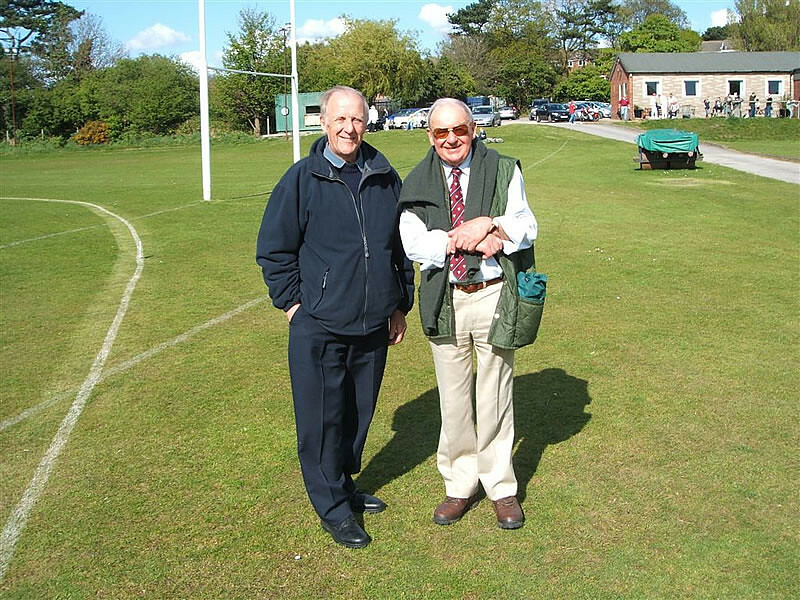 I was deeply honoured to become Club President at the Association AGM in April to follow in the footsteps of our founder H. Martin Curphey and another absolute legend, Ronnie Caton. 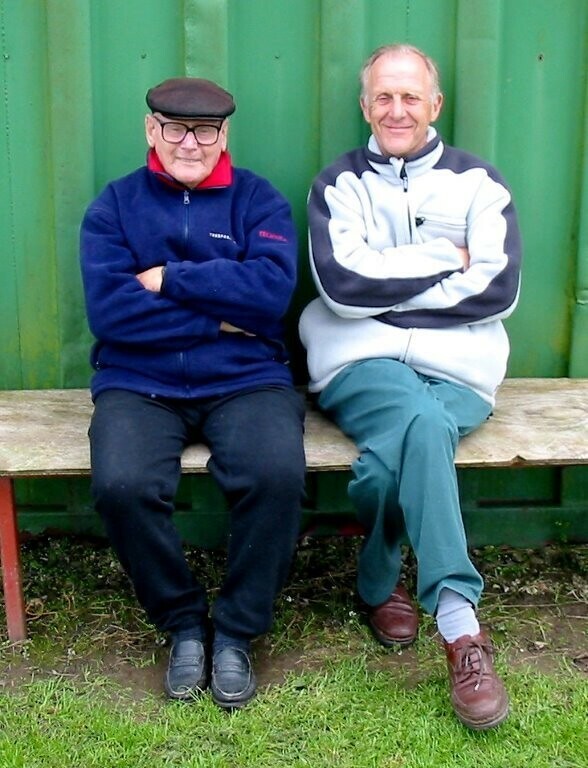 When I started playing adult rugby for the club, whilst still at Park High School, in 1972 these were the gentlemen who were both feared and revered by all the players. It was left to the likes of C.K. 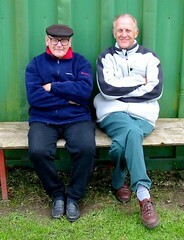 (Ken) Wilson and Gilly Cannell to offer a more gentle introduction to new young players to the club!! Off the field the club continues to go from strength to strength and due to much hard work both rugby and cricket junior sections are thriving and growing! Both senior rugby and cricket now only field two teams but there is a good spirit and results whilst not outstanding are certainly at least reasonable. Of course new adult players of both codes are always most welcome at any time but there is no despondency about the place and we look forward to our continuing development on the field of play! I hope to see most of you over the Christmas period and especially on Boxing Day, a date which has been close to my heart since 1980. It is to be hoped that for the 34th consecutive year that the playing of The Brothers v Veterans game will take place for The Beckett Hillan Shield. 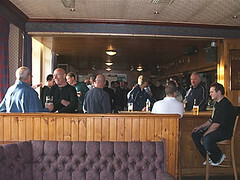 The club opens at noon and the game will kick off at 1.30pm. My late father loved this day and in 1981, the 2nd playing of the game, sponsored The Beckett Shield and he loved the Hillan brothers too! When thought that they had lost the original shield the family sponsored the new Beckett Hillan Shield only for the original shield to turn up a short while later!! It is on this day that we remember loved ones who have passed away. Myself, I especially think of my father, Harold, a rugby man through and through, Gus and Donny who were founding members of this special game too and just loved the day so much. However, as the years pass we need more and more newer players to take part; you do not have to be a Brother or a Veteran or even play for our club just turn up and you will get a 'run out'. 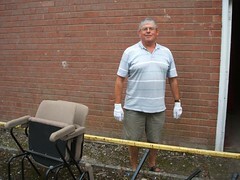 Also we need much more help on the day with organisation to ensure everything runs smoothly. 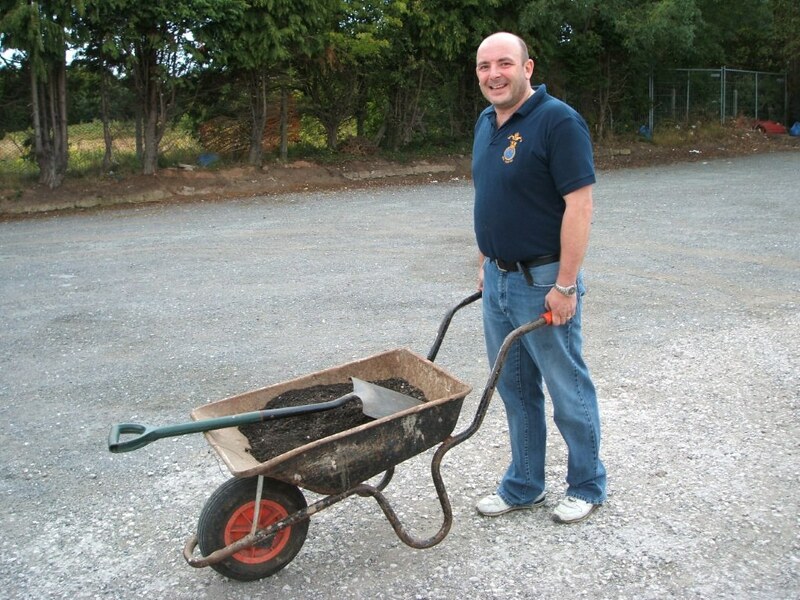 Finally I would like to thank all volunteer workers of the club, in whatever capacity, and all bar staff too for all their hard work in 2013; it really is so much appreciated. Hope you all enjoy a wonderful festive season. Richie Beckett. President. Old Parkonians Association Limited. Further to the motion passed at the AGM earlier in the year, the Association has now completed the process of converting to a limited company, The Old Parkonians Association Limited. The effect of this is to remove the personal liability of officers of the Club to uninsured losses. The directors would like to thank the former Trustees of the Association, namely Kenny Cooke, Richard Fallowfield, Eric Potter for their work and support in recent years. The change to incorporated status is not expected to have any significant impact on the day to day running of the Club. After the recent most generous donation towards currently injured rugby players I feel duty bound to report upon another unofficial section of the Old Parkonians Association and that is 'The 45 Plus Club'!! More and more I feel that the Club in the winter months late afternoon/early evening is ' held together' socially by these guys! In the 'inaugural meeting' @ 5pm on Saturday 16th November in attendance and in no particular order were Kenny Owen, Kenny Oram, Graham Bennett, Robbie Atkinson, Terry Grundy, Keith Aldcroft, Dave Smith, Richie Beckett, Alan Morris Snr., Alan Morris Jnr., Danny Hughes, Steve Lowndes, Mike Hawker, Stevie Taylor, Peter Browne, Alan Muir, Dave Westwater, Geoff Davies, Alex Drake, Steve Williams, Pete Evans, Chris Hall, Terry Marnick, Mark Hillan(playing), Martin Varley(playing), Peter Hillan(playing), Stew McEwen(playing). Just missing out i.e. being too young are Tony Berkson and Tim Hassall. Steve Roper maybe but isn't he only 39/41?! In absentia and regulars on a Saturday winter tea time are Eric Potter, Norman Morris, Paul Corvers, Tony Burton, Steve Barnett, Kenny Cooke, Robbie Knight, Steve Kierney, Carl Handley and Steve Parnell. Ladies missing out but perhaps in their early/mid 40's Jo Hillan(forgotten your age Jo), Jane Burton(same as Jo just turned 40) and of course Sue Hillan and Anita Handley. 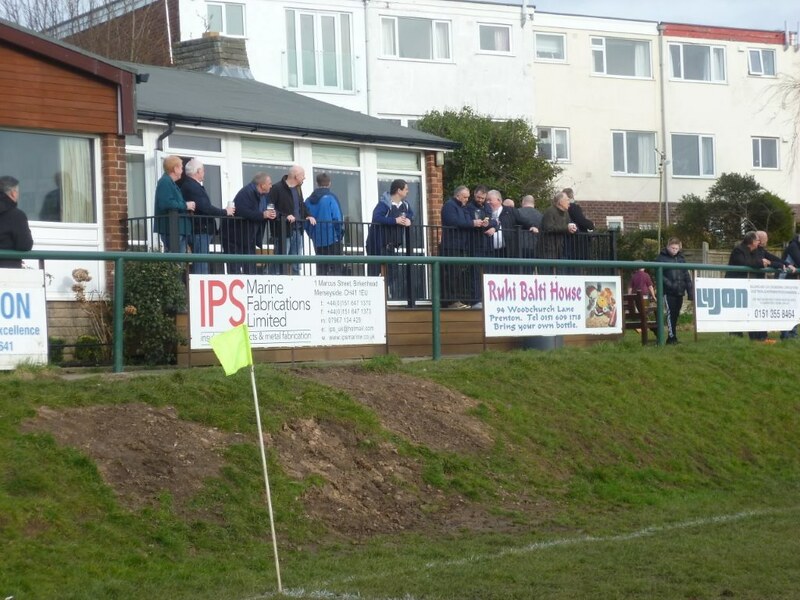 These people are the life blood of the club so much and support the playing side just by being there as well as all the other roles that they take on too! Sure I have missed people out and that you will let me know and very soon too! In the meantime thanks to you all. 5 years ago ago by Old Parkonians. Dave and Joyce Westwater would like to thank all those friends who braved the winter weather to help them celebrate their Golden wedding party at the Club on Saturday 23rd March 2013. 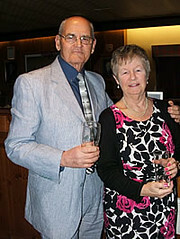 We had a lovely evening, thanks for all your best wishes, see you all again in 10 years at our 60th. The very kind gift we received from Club members (even though gifts were banned) has been donated to the Development Fund. Carling lager is now being positioned as a "premium brand" which has resulted in the price going up by 30p a pint! Because of this, Carling will no longer be sold at the bar, leaving Fosters as the standard lager with San Miguel as the premium offering. 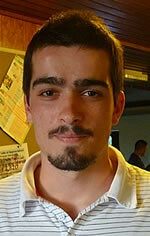 "My name is Héctor Ruiz, I'm 24 years old and I'm originally from Burgos, a small yet very nice city in northern Spain. I came over to England in April 2010 to study in Liverpool John Moores University. I first met the Parks in a summer training session at New Brighton beach in July 2011. Despite the fact that I was new to rugby, I received a warm welcome and was encouraged to come back again. I'm glad I did, because the atmosphere in the club is great and people are very friendly." Welcome to Old Parks Hector! James Adie (adiej@hope.ac.uk) and Katie Lambert (k-lambert86@hotmail.com) at Liverpool Hope University are investigating well being in sport and are looking for people to assist with their research. This involves completing the survey at http://www.surveymonkey.com/s/2B3BWTB which should take about ten minutes. If anyone has any questions about the research, contact James or Katie directly. Update - 19/09/11: Visits to the Home Page of the main web site from mobile devices will now be redirected automatically to the mobile site. A link there enables the main site to be accessed if required. A site designed for access from mobile devices is now available at http://m.oldparkonians.org.uk - in the last month over 100 visits (just under 10%) to the main site have been from mobiles. The objective of this site is to provide easier access to content that people may want to get to while away from a desktop PC - e.g. details of fixtures and kick off times. The site is accessible from desktop PC browsers, but is designed for use on small screens. One problem about developing content for mobile devices is the range of different operating systems and browsers and the physical characteristics of the devices themselves. To offer access to as wide a range of mobile devices as possible, the site has been put together using the new JQuery Mobile framework, which offers support as outlined below. Contact Alan Morris with any comments about functionality and suggestions for content that people would find useful. 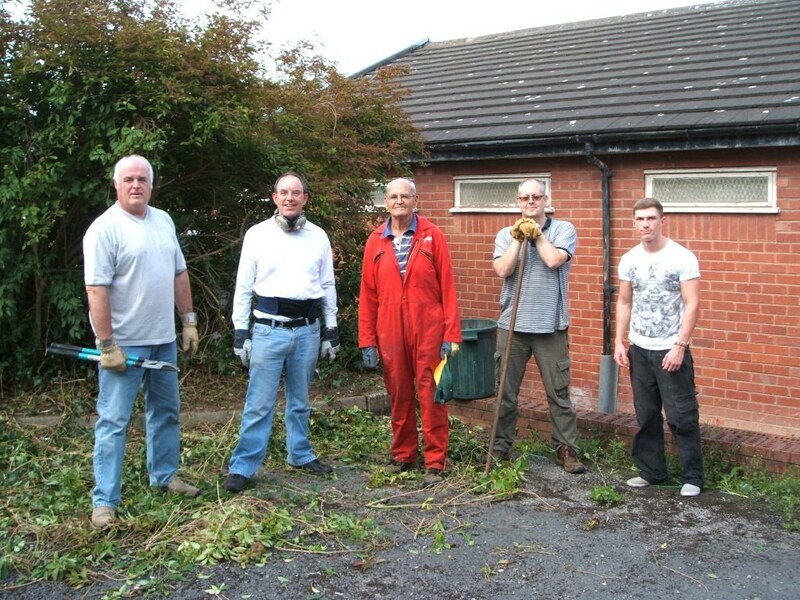 Car park, play and old forge areas weeded and tidied. 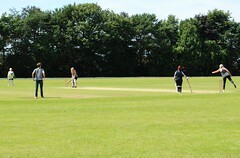 In addition, the First Team pitch was marked by Gareth Pryce. 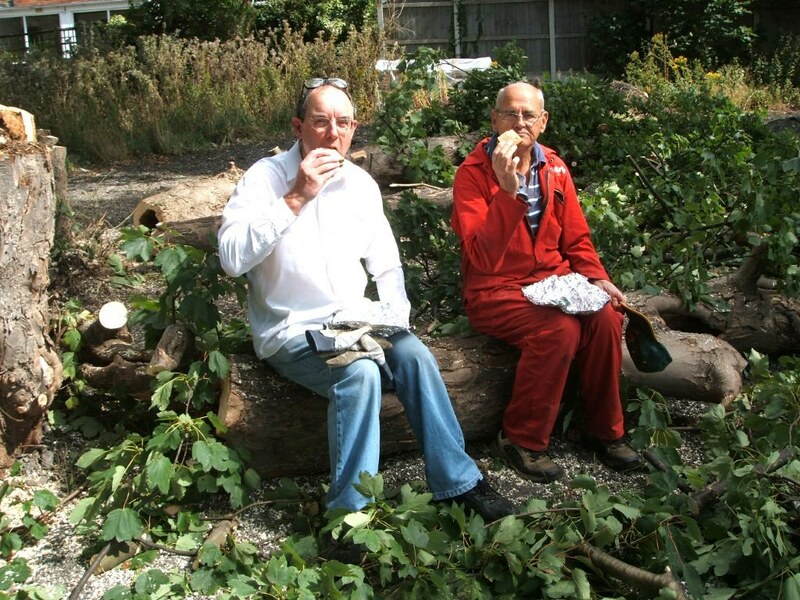 The volunteers were were fed and watered after several hours of graft - thanks to Mel for the sandwiches - and thanks to everyone who turned out to help to prepare the Club for the forthcoming Rugby Season. In 1950 the Headmaster of Birkenhead School Mr W.F. Bushell, donated a new cup to the increasingly popular game of squash racquets. 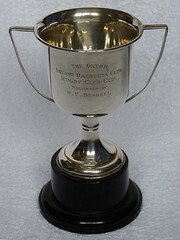 The basic outline was for local rugby clubs each to enter a team of 5 players from past or present rugby teams to compete each year for the cup. At first Old Birkonians, Birkenhead Park, Waterloo and New Brighton dominated as victors although Old Rockferrians, Old Instonians and Old Parkonians regularly entered the competition. It was not until the last year of the competition 1976 that Old Parkonians won the Cup. 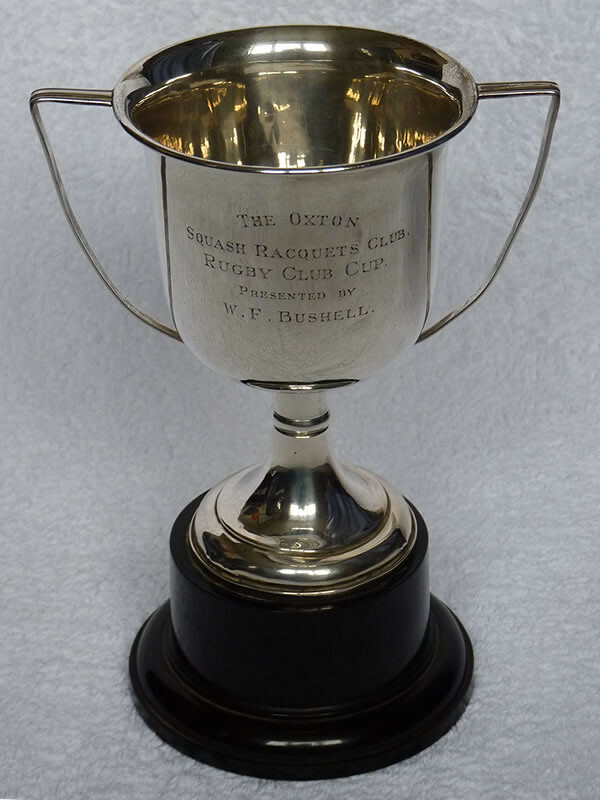 The Cup itself originally resided in the Oxton Squash Club which closed many years ago. 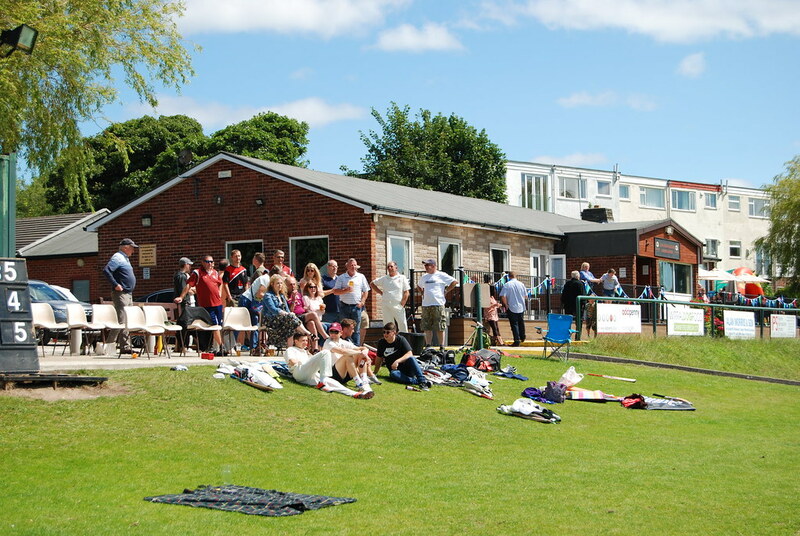 This club is still sadly missed (Old Parkonians played their home games there) but as final winners the Old Parkonians held on to the cup and it is now kept in the Old Parkonians' Pavilion in Holm Lane. It must be emphasised that the motivators of this competition were the Old Birkonians. They were excellent hosts and played top class squash. Bushell Cup nights at all clubs were popular and although games were hotly contested the cameraderie was superb. This is reflected how our local rugby is played and is a tribute to the original thinking of Mr W.F. Bushell who, until he died, presented the trophy each year to the winners. The Cup itself shows that in 1962 Birkenhead Park and Old Birkonians were joint winners a very unusual happening. I understand that this was because the final was a very close, hard fought affair and went on so long that the bar was in danger of closing before the match finished - an unthinkable situation. It was therefore agreed by the two Captains that an honorable draw be declared. It was very much through the efforts of Doug Brown that Old Parkonians finally joined the illustrious names on the cup as he was Captain that year (as he had been several years previously). Other team players involved between 1965-1976 include: Les George (Captain for two years), John Fullard, Stan Prescott, Bob Powell, Dave Williams, Tom Whitfield, Gerard Gordon, Peter Grannon and Ralph Pearson. There were certainly other people involved so if you have any further information please let me know through the Club - see Contact Us for details. Special thanks must go to Peter Hartley, Past President of New Brighton Rugby Club for supplying some interesting background. He was an enthusiastic supporter of the Bushell Cup as well as being a top class player and very successful coach. Thanks Peter. 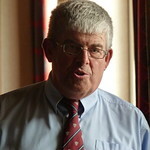 Jim Kendall, 'Star Full Back' and 1957 Captain sends best wishes to all friends and rugby forwards! 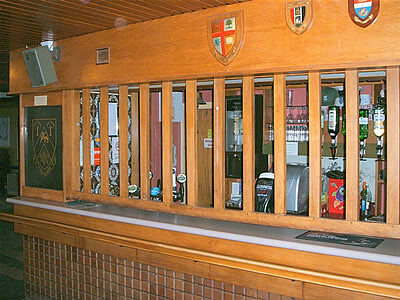 With effect from 1st January 2010 bar prices will be increased. On a brighter note our product range will be broadened next week to include San Miguel, a popular premium lager. Another excellent year with more positives than negatives. Lots of progress in all areas of the club keeping up the momentum of 2008. The 1st team pitch is holding up very well, the new areas have coped extremely well with the recent 30 days rain out of 35. The outcome of all our efforts has been a great atmosphere at Holm Lane leading to increased usage which has kept us on an even keel financially in these recession hit days. 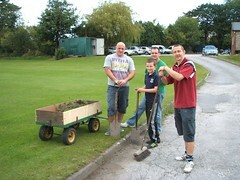 Many people doing something for the club are to be congratulated for their continued support. No prizes for project of 2009, there are too many, but on a practical note the ‘Steve Williams Team’ flagged path from the rugby viewing path to the car park is a big plus. Let’s look forward to 2010 with great optimism and hopefully good news on Mike Beckett’s sterling work regarding the new development. 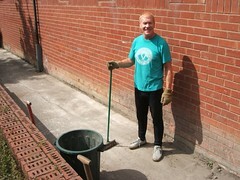 Support the Old Parkonians in every way you can, sign up to the monthly development scheme and pledge a minimum of £5. Season’s greetings from Joyce and myself, we are off to Italy but will be back for Boxing Day. 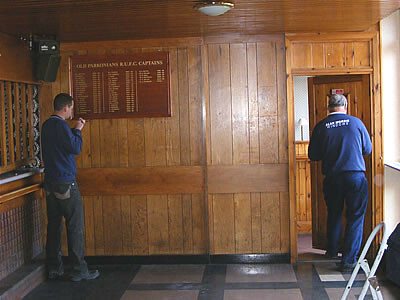 The Association maintains a jobs list that tracks items of work that are needed to maintain the facilities around the ground and clubhouse. 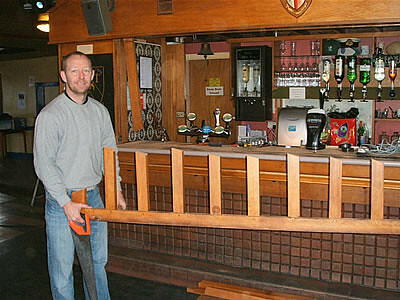 Were money no object we would simply pay for this work to be carried out, but the reality of a club like ours is that we rely largely on volunteers to maintain what we have. Click here for the current jobs list which is in PDF format. Remember, the Club relys on volunteers and if members are willing to spend just a little time on helping with maintenence it will help keep our facilities in good order. Avoiding expenditure on getting work done will also help keep the subs down! 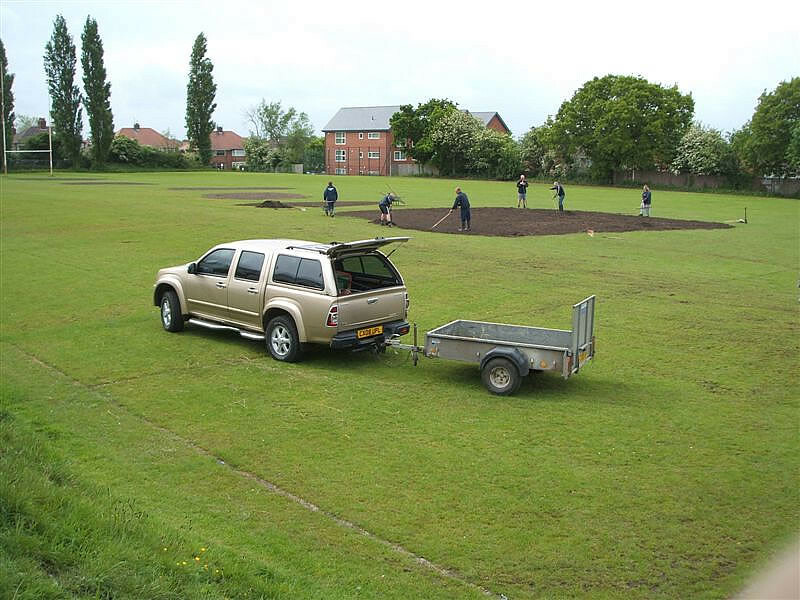 Thanks to all those volunteers who spread 50 tons of top soil on the 6 very bad areas of the 1st team pitch last Saturday/Sunday, 16/17th May. On Sunday the weather was atrocious but to their great credit nobody took an early bath, top marks to Matt Prescott and Jess Pryce who worked as hard as anybody, it was a great way to get rid of her hangover. 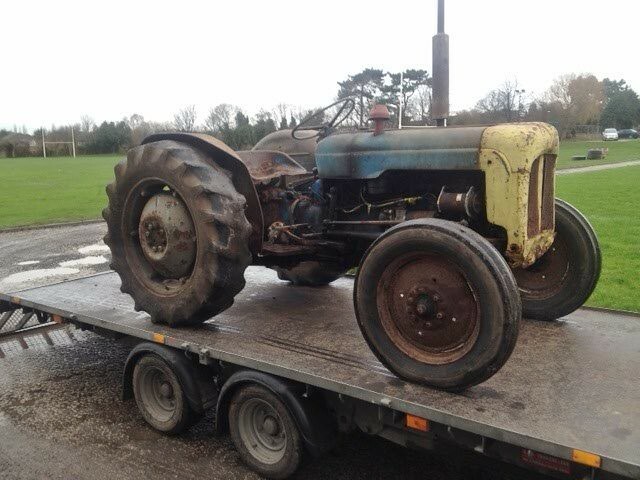 Our Graeme Bennett, Capenhurst Tractor (the Beast) was invaluable in completing the job. Due to the conditions the seeding was finally done on Wednesday morning. 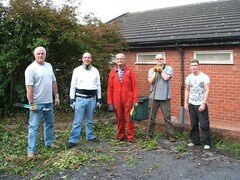 Well done to all those involved in the project, we hope it makes a big difference next winter. 5 years ago ago by Old Parkonians.We have had visits in the last two weeks from two life members, C.D. 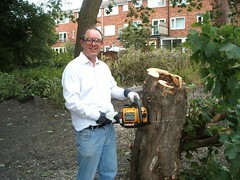 Forbes who lives in Norwich and Dave Evans in Cumbria. They are both pictured in the 1956/7 team on the History page. Colin left the district in 1959 to work abroad and eventually settled in East Anglia. He was well known for his suede shoes, trademark moustache and monocle. It was a pleasure to see him again last week at Holm Lane, shoes and moustache on show, no monocle, but sporting a very dashing cravat! Probably the most cultured second row pairing we have had starred CD and CK Wilson. Dave Evans was Captain of the 1957/8 season, mainly because he had a 1930s Lanchester which could carry two thirds of the team. He is pictured with our President Geoff Davies who never became Captain as he only had a two seater. It was a pleasure to see them at the club, they were most complimentary about the grounds and general atmosphere, a tribute to all those involved at the club. 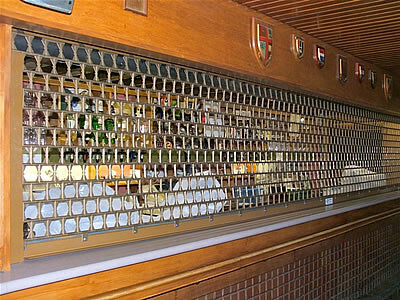 It is 'time gentlemen please' for the old shutters at the bar. The 'Heath Robinson' mechanism was probably an idea more suited to a heavy lift in the shipyards and was a difficult job to remove from the loft - ask the Marnick boys! 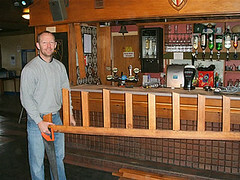 The taking out and reconstruction of the shutters was done very ably by Dave Galwey. If you want some first class joinery or cabinet making done, contact him by the new shutters any Saturday afternoon. 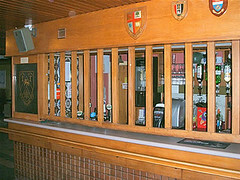 The new electric units improve the looks, security, insulation and help the bar team hernias at opening and closing times. Carl Brannan sponsored the removal of the tiles as they reminded him of something he would rather not remember. 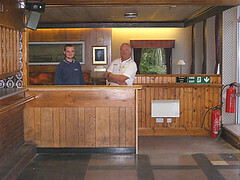 New lighting will be installed this week and further work to the rear of the bar will take place shortly. 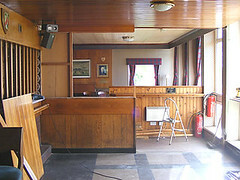 At the same time we have upholstered the lounge seating and wallpapered the lounge as in the bar area. For example, we would like to put paving stones between the viewing path on the right hand side of the clubhouse and the swing area to provide access for parents and children. WHO WILL TAKE THIS JOB ON? 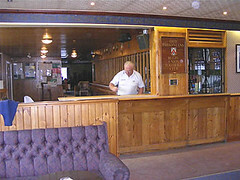 After much discussion, a decision was finally made to open up the bar and lounge areas in the Clubhouse. The work was entrusted to Alan Morris & Son who completed the transition in a day. Early reports indicate that the lounge area of the Clubhouse is now seeing increasing usage! The Association have now received confirmation that the recent application for National Lottery funding through Awards for All has been successful. The application to Awards for All outlined the Cricket and Rugby played at Holm Lane as well as the use the Association's ameneties by the local community for both sport and social activities. The Association's Clubmark accreditation was also mentioned in the application to demonstrate our commitment to providing a safe environment in which young people are encouraged to become involved in sport. We expect the new equipment to be bought soon and will update the web site with information on how these superb new assets will be used to the benefit of both members of the Association and the local community.